Last week my husband and I had dinner with some friends at a local pub. Though most of the menu was your typical pub fare (or at least an American concept of it), it did contain a few vegan or easily veganized dishes. One of them was a shaved Brussels sprouts salad that turned out to be delicious. I’d never had raw Brussels sprouts before and was a little wary, but shredding makes them tender and mellows their flavor. Of course, I had to try making it at home, with a few healthier substitutions. It was actually easy to make a version much lower in fat and sugar than the one I enjoyed at the pub. 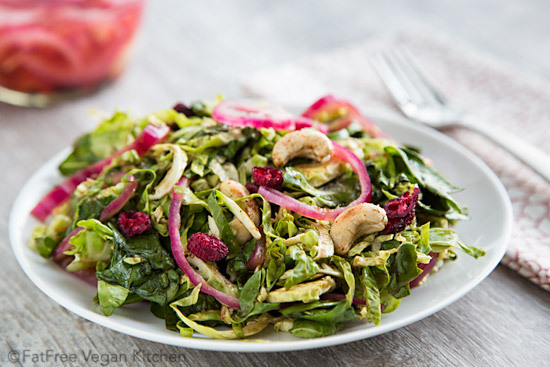 I just used a basic fat-free balsamic vinaigrette, reduced the amount of cashews (the pub’s salad was about 1/4 cashews, I kid you not), and used unsweetened, un-oiled dried cranberries instead of the type usually found in stores. Because they were a little tart, I used more maple syrup in the recipe than I normally would have, so if you make this and use sweetened cranberries, you can reduce the maple syrup in the dressing by about half. If you’re looking for a salad or light side dish for your Thanksgiving dinner, I think this shredded Brussels sprouts salad would be perfect. You can make the separate parts of it ahead of time and throw it all together at the last minute. I also found that it tastes good (but doesn’t look as pretty) the next day, but keep the spicy cashews separate until right before serving or they will soften and lose their spice. 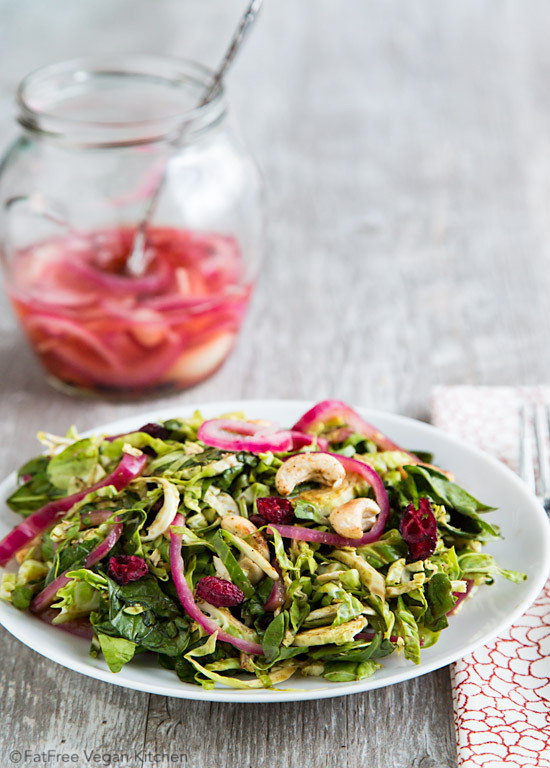 Note: The Quick Pickled Red Onions are based on this recipe. You will probably have some leftover–which is great! They make a delicious addition to salads and sandwiches and will keep in the refrigerator for several weeks. Store them in glass. 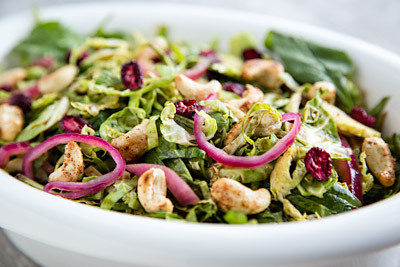 Dried cranberries, spiced cashews, pickled red onion, and a tangy maple-mustard vinaigrette make this shredded Brussels sprouts salad sparkle with flavor. Make the pickled onions at least a half hour before putting the salad together. Slice 1/2 of a large red onion. Place it in a strainer, hold the strainer over the sink, and pour a quart of boiling water over it. Set aside to drain. While it is draining, pour the vinegar into a glass storage jar or bowl, add the sugar, salt, peppercorns, and garlic to the vinegar and stir until the sugar is dissolved. Add the drained onions to the jar, stir gently, and set aside to cool. Pickled Red Onions will keep for several weeks. Place the cashews on a baking sheet and toast in a toaster oven or in a pan over medium heat until the just begin to brown (2-3 minutes, normally, but watch carefully to make sure they don't burn.) Pour into a bowl and drizzle with 1/2 teaspoon of maple syrup. Stir in the spicy seasoning of your choice and set aside to cool. 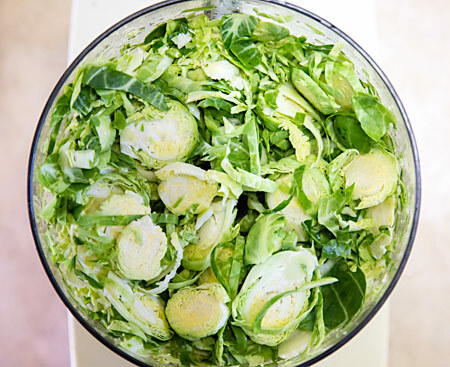 Put the shredded Brussels sprouts into a large salad bowl. Use your fingers to separate any large slices into shreds. Add the torn baby spinach leaves and dried cranberries. 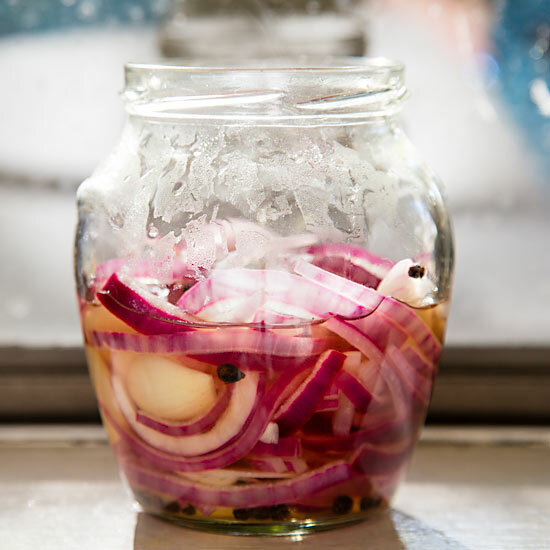 Measure out 1 cup of the pickled onions--drained well-- and add them to the salad along with the dressing. Toss well. Sprinkle with the spicy cashews just before serving. The dried cranberries I used contained no sugar or oil and are of a lighter texture (and nutritional value) than the cranberries that are like raisins. I used their nutritional analysis when figuring out the Nutritional Info for this recipe, so if you use regular dried cranberries, the recipe will contain more sugar and, perhaps, fat. Please pin and share: I hope you enjoy it. Remember to check my Thanksgiving Recipes for more holiday ideas! ps: also nice to know WF has some dried cranberries without oil or sugar–they are hard to find! Thanks, Maria! I feel like I’m very late jumping on the shredded Brussels sprouts bandwagon because I love them so much cooked that I hadn’t felt compelled to try them raw. They really are delicious this way, though! If you get to Vitamix by clicking on one of the links in this post, I will automatically get credit. Thank you! I hope you love yours as much as I love mine. Looking forward to making Shredded Brussels Sprouts Salad with Dried Cranberries and Cashews for my Thanksgiving potluck. Does the salad need dressing? Or do the juices from the pickled onions suffice? That’s quite all right! I hope you’ll give the recipe a try. You can really use any vinaigrette you like, though I’m partial to mustard in this. and a big thank you for this site in general–we are doing (trying) forks over knives and you are a tremendous help! I love cashews. It is probably one of the best ingredients. I have to try it soon. I’ve got everything ready to make this, it looks delicious. Thanks for the recipe! I do have one request for future recipes. Where I live, purple onions can be really tiny to a medium size. Would it be possible to give approximate weight values for the onions (and other veggies) especially when the quantity is listed as 1 or 2 (rather than 1 cup, etc.)? Made this today and loved it! I think the cashews are so good that I’m thinking about making a batch to give as Christmas gifts. Thanks for your great recipes. Happy Thanksgiving! I’m so glad you liked it! I love the idea of making the cashews for gifts. Hope you have a great Thanksgiving! we had pizza last night and used half a red onion on the pizza and saved the other half for pickled onion. Rest of the salad was “the usual” but the onions got nice reviews. Can’t wait to try the maple mustard vinaigrette. Thanks as always. I think I am now addicted to the pickled onions. LOL They are great. Me too! I’m not a big fan of onions on sandwiches, but I could put these on everything! Glad you like ’em! Susan – your recipe looked so good that I made it yesterday for the first time to take to a Thanksgiving dinner. It turned our perfectly and not only did my husband and I really enjoy the salad, all the other meat-eating guests did as well. My salad looked as pretty as yours too! Thank you so much for sharing such a lovely recipe! Delicious! We made it for first time today to take to a belated Thanksgiving dinner and received compliments even though we forgot the pickled onions at home! Thanks Susan, my husband and I really enjoy your recipes. This was fabulous, so crunchy and fresh. Thanks for the recipe! Fantastic recipe. Thank you for sharing it just in time for Thanksgiving. I was looking for a new, healthier brussels sprouts dish this year and you covered it for me. 🙂 Not a hit with the kids but all the adults loved the unusual combination of flavors. It was worth the time invested in shredding the brussels sprouts without a food processor. I went looking for this because I had some brussels sprouts to eat before leaving town tomorrow. Perfect! Really enjoyed it. The cashews add the right amount of crunch and spice. Also nice that you can make it in parts and put together at the last minute, so it can be a potluck salad as well. Sounds like a great recipe, definitely will be having a go at this one, I have plenty of brussel sprouts and just love cashew nuts. Is there anything I can substitute the creole seasoning with? Thank you! Chili powder would be good. But really, any seasoning you like. Made this last night and it was really good. I didn’t have dried cranberries so I used raisins. I also toasted the cashews on top of the stove, which worked out fine. Mollie Stone’s had shredded brussels sprouts in bags, which makes this salad really convenient and fast. I had one lone stalk of raw broccoli to use up so I made “confetti” out of it with my immersion blender and added it to the greens. I will definitely make this again when I have people over. I ate it last night with a baked potato and 911 gravy! I think Pickled Red Onions are going on my regular rotation list. Like the jalapenos! So great on salads. Have you ever bought roasted chickpeas from an Indian grocery store? (although, I know you can make them)…. I didn’t have cashews, nor did I want to buy them because they are a big binging trigger food for me. I used roasted chickpeas instead…. and WOW! They are amazing with your maple syrup and cajun spice trick! The ones I used were simply roasted with no added oils or salts. Maybe try that out! As always, I love your recipes! Made this for Thanksgiving and it was a huge hit! Superb salad, thank you.